Let the Fire Fall! 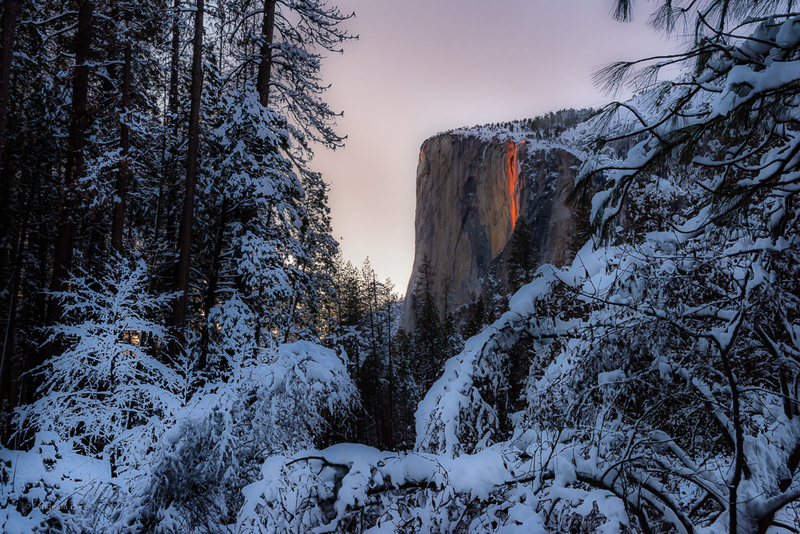 The Firefall season has arrived in Yosemite, and Feb. 11th was the first show of the season. This is the Horse tail waterfall in the Yosemite National Park. Every year for a few days in February, the sun sets at a certain angle and illuminates the waterfall in luminescent orange and red, making it look like a molten lava. As snow and rain were suppose to be back for the rest of the week, I took a chance to drive out Monday morning. What was supposed to be a quick day trip, turned out to be a harrowing 12 hour round-trip. My GPS took me to the wrong road for the park entrance. After putting and taking off tire chains twice, my first time doing this alone, and then driving at 15-20 miles/hour due to snowy and icy road conditions, I was happy to enter the valley after 8 hours, but then I had to drive twice through the loop around the valley as I could not find a place to park my car. The snow was piled up really high alongside the roads, making it almost impossible to get any good perspective. Finally, when I looked at the waterfall, there was barely any flow because it was too cold. However, the sun on the western sky was shining bright so I had some hopes. Much to my delight, the water started trickling along with a few avalanches mimicking the waterfall. 15 minutes before the sunset, my camera stopped working. It was cold, and the batteries were dead. A battery tucked away in the warmth of my jacket pocket did the trick at the last minute. Finally, when I looked though my lens, there was this snow covered beauty all around me. So, I did something differently this time. Instead of zooming in, I decided to use a wider angle to capture the breathtaking beauty surrounding it. I have seen two Firefalls before (2016 & 2017), and this was likely the less “fiercest” of all, but I have to say this was one of the most beautiful given how it looked surrounded by fairy-tale like snowy atmosphere. I have been getting a lot of questions on social media about this phenomenon. As it is getting hard to respond to every message, I decided to address them here for everybody. Please be aware that my answers are only relevant to my experience this year (2019). I am seeing so many pictures of Firefall on social media this month. Is it over? I have no idea how to say this in a nice way. Every single year, come Jan or Feb, a lot of photographers start posting photographs of Firefall from previous years. I really never understood why they need to post these old photographs when it confuses the general public into believing that it is from this year. Unlike last year, no permits are needed this year. I think the park has been extremely busy cleaning streets and repairing damages from the snow storms. They might not have the bandwidth to manage the permit situation. Great question! Unlike previous years, when one of the lanes on the Southside road would be dedicated to parking, there is no such provision this year. Please don’t leave your car there unless it is a designated parking space. Yesterday, based on my previous year’s experience, I tried parking my car on one of the lanes, and was immediately honked and shooed away by one of the park’s busses. This could be due to the fact that the roads get cleaned after snow storms, and the huge pile of snow needs to be plowed away towards the side of the streets. So, the parking is fairly limited. Be prepared to walk for up to a mile. I tried driving to the Northside first as I have never shot from there. However, I could not even get to the spot as the snow was piled up so high that I didn’t know where to park the car, much less find a vantage point. I drove to Southside, but due to snow everywhere, I had a difficult time orienting myself. Unlike a lot of people who know Yosemite very well, I am fairly unfamiliar with all the roads. As a result, I ended up missing the spot on the southside and drove away without even realizing it. Finally, I did come back and found a parking spot on the southside, but honestly, I have no idea where exactly I was on that road. Do I need car chains even if it is not snowing on that day? Yes, yes and yes. I saw so many people sent back from the park gate as they were not carrying car chains. While I was there, chains inside the park were mandatory. Honestly, I would not be alive if I didn’t have chains on. Because of major snow storms and cold temperatures, there is snow everywhere. All of that snow is not going to melt away because of one non-snowing/sunny day. Even if the weather is predicted to be clear and sunny, please bring car chains. Also, if you drive an SUV, please be patient with the cars in front of you. Yes, it is cold, but you may want to ask the people making these predictions that what qualifies them to say that. Specially, these are some of the same photographers chasing firefall in Yosemite. Just because they didn’t catch it during their stay, they have been dissuading everybody saying that it will not happen this year. We have been fortunate with a lot of snow this year. We just need the weather to warm up a little. What I got was not a “roaring” firefall, but I am still happy with what I saw, specially with the snow. Please bring snow boots, gaitors,, hand warmers and whatever makes you comfortable walking in knee-deep snow. I even brought my micro-spikes, but didn’t use them. However, things get “icy” right after sunset so please bring head lamp and use caution when walking towards your car. Importantly, I had a difficult time visiting the park even when the park was open. I shudder at the idea of another government shut-down. If that were to happen, I am not sure if it would be safe to enter the park. I will keep updating this section as more questions come along. Please stay tuned.